The decoration of the venues, concert halls and different areas today is very important. There are many options and ideas create a festive design. One of them is the brain for the simulation. Try to make a clown balloon with their hands. 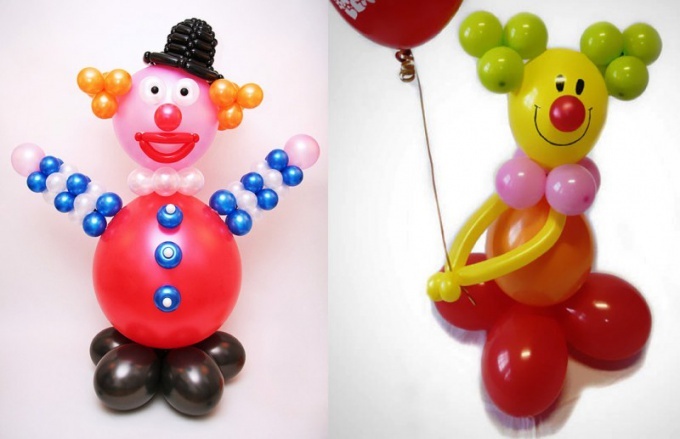 To create the clown you will need: latex balloons. You can buy them in stores where goods are sold for the holidays. At the end black ball tie 3 knots, one on top of another. Cut the resulting triple knot, place it in a big red ball and move to the top of the ball. Hold the knot. The remaining part of red balloon clip black (which you cut) under the node. Inflate a pink balloon up to 0.5 m in diameter and a large red ball to 0.8 m, and then tie their tails to each other. Then staple three "two" of balloons 5" pearl color. Connect all ready "two". You have a module consisting of six mother of pearl balls. Lock it between pink and red balloons. Prepare one "poor" 11" and two "two" of the 10 black balls. Staple three "twos" together. Fill the other two black balls the size of 12" "weight" 1 liter of water. Attach it to the black module. Fix the red ball on the module from the black balls with blue balls for the simulation. To create hands homemade clown make a line of four modules. In the same way create the other arm. Attach a big red ball of the hand-chain. Pearl inflate the ball 5" to 1" and blue ball 5" to size 4". Tie it in a knot almost at the end. Push the knot inside the blue balloon. Grab a bundle of "two" and secure it to the ball. Attach the button on the red ball and secure it with double sided sticky tape. The same way do and secure two more such buttons. Of pearl and black balls 5, create eyes for the clown. Attach them to the pink ball-head with double-sided tape. Red ball 5" make the nose and attach it on the face of the clown. Of the red balls-sausage lips create a smile and attach his mouth to the face with double sided sticky tape. Collect hat made of black beads and put it on the head of a clown with duct tape. Prepare eight "fours" of the orange balls and attach them with tape to the head of a clown. The result is hair on the sideburns. All your homemade clown balloons ready.